Attorney Motunrayo "JR" Awotona obtained his undergraduate degree from Georgia State University and earned his J.D. at Atlanta's John Marshall Law School while working full time and raising a child. He focuses his law practice largely on immigration law, including deportation cases. Unlike many attorneys who merely practice Immigration Law, Mr. Awotona has also experienced it from the other side. 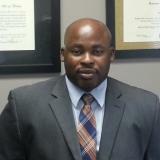 Having immigrated to the United States from Nigeria as a child, he has a unique understanding of the personal issues involved in Immigration Law. Attorney John Steakley is a 1996 graduate of the University of Tennessee College of Law. He began his career as the Special Prosecutor for Drug Crimes for a multi-county, multi-agency drug task force in Tennessee, where he represented the State of Tennessee in thousands of felony and misdemeanor cases in a 5-county judicial district. He was selected by the National College of District Attorneys to attend advanced legal seminars in Santa Fe, New Orleans, San Francisco, and Houston. In 2000, he was appointed to the position of Special Assistant United States Attorney for the Eastern District of Tennessee by Attorney General Janet Reno, and reappointed again the following year. In 2006 he was a founding partner of Crosby, Haldi & Steakley, LLC, located in Decatur. Now in private practice since 2007 as John A. Steakley, P.C., headquartered in Marietta, he represents individuals in a wide variety of matters, using his experience to provide his clients with quality legal representation. He is licensed to practice law in both Tennessee and Georgia, but focuses almost solely on Georgia. In 2012, the Georgia Supreme Court certified him as a Mentor for theTransition Into Law Practice Program, serving as a role model and mentoring young attorneys just entering into the practice of law. This came on the heels of years of coaching the Emory University Law School's Mock Trial Team in how to be effective and successful courtroom litigators. In addition to advocating for his clients in the courtroom, Mr. Steakley is a strong proponent of individual liberties. He co-authored a scholarly work on whether the United States Constitution afforded citizens the right to record their interactions with police even in private places. This article has garnered attention and raised awareness about this timely legal-technology issue, and was named one of the "Must Read Articles of 2012" by the National Association of Criminal Defense Lawyers. He is a member of the Tennessee Bar Association, the Tennessee Supreme Court, the Tennessee Court of Criminal Appeals, the Tennessee Court of Civil Appeals, the State Bar of Georgia, the Georgia Supreme Court, the Georgia Court of Appeals, Georgia Association of Criminal Defense Lawyers, National Association of Criminal Defense Lawyers, Gwinnett County Bar Association, and Cobb County Bar Association. When not practicing law, Mr. Steakley is an instrument-rated private pilot who enjoys flying around the Southeast. He has been a pilot since 1999. 09 July 2017 Cobb County's "Drug Whisperer"
17 March 2017 "Georgia's Public Defense System Needs A Major Fix"
07 November 2016 "Court-Appointed Attorneys Do Little Work, Records Show"
20 March 2016 Do School Bus Cameras Work? 19 November 2014 Why Do Innocent People Confess?